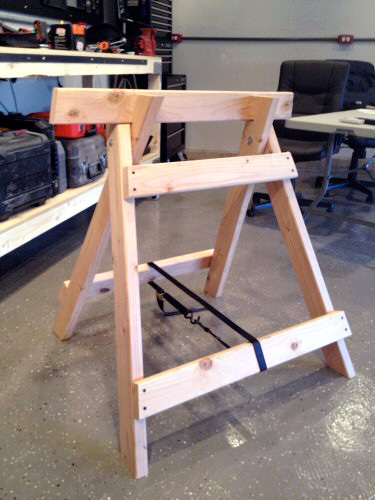 In early January of this year, I showed you how to build some awesome, folding sawhorses. I still love these sawhorses, and I use them all the time. Well I’ve made one small modification so that they easily hang on the wall, and I wanted to share it with you. These sawhorses have three supports that span between the two pairs of legs. 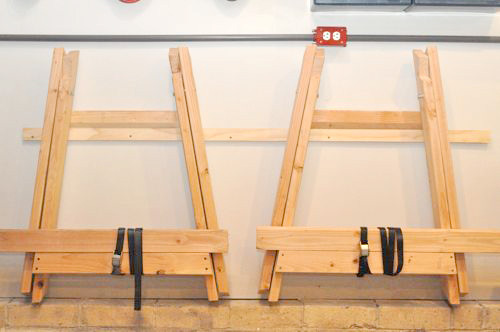 There are two lower supports and one upper support, and by modifying the upper support to include a French cleat, these sawhorses easily hang on a wall in your workshop. 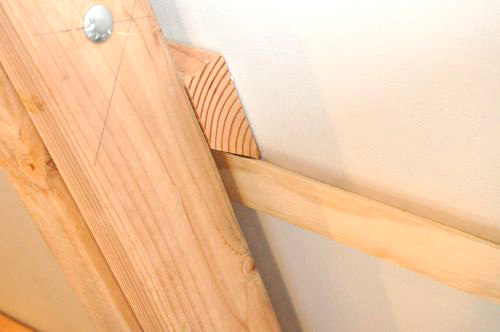 French cleats have been around for a long time, and you might remember that I used one to build my wall-mounted lumber storage. French cleats are super strong, easy to make and a great addition for these sawhorses. To make this French cleat, I cut a 45° angle on the inside of the upper support. Next, I cut a matching 45° on a strip of plywood and mounted that to the wall. I used a level to keep everything looking nice, and all the screws go into studs. I hope this quick tip is useful for you, and that you keep enjoying those sawhorses as much as I do. Do you get tired of wrapping and unwrapping the straps? Would a fixed length of webbing work or is the adjustability necessary? It’s not too bad. I have thought about trimming the excess length or modifying the tie-down so that the lock is on the longer piece (so that I can get rid of the other piece). Would it work to add some sort of hooks to the bottom of both bottom cross supports and run the strap between them? That way you only need half the strap, the sawhorse still folds up, and you can use the strap to wrap up the top cross member when not in use. Looks great. Now I just need enough wall space in my shop and I’ll be good to go! French cleats – very low tech yet high usuage concept. Very nice on both sawhorses and storage. I joined after the initial posting but have enjoyed catching up. I painted the ends of some sawhorses with the herculiner (truck bedliner in a paint can) and it helps add some no-slip grip. I can always appreciate, as well as need, storage tips. Got great stuff just need to be better organized. I always enjoy your posts regarding your shop, thanks. That’s a great way to store them. I have just enough space behind some racks that I may be able to squeeze them in there. Thanks for the idea. 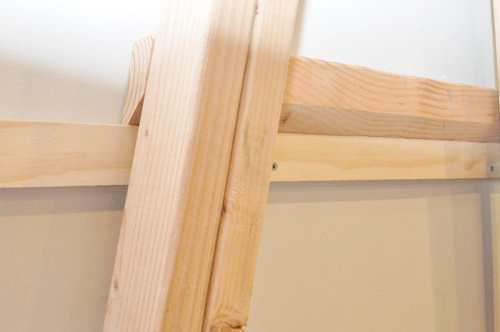 Nice sawhorses and nice design to place them on the wall. Good job again! Well looky there! You rock saving space! Discovered your site through this article on Art of Manliness. Brilliant Site!!! Never experienced a website/blog with a rewards program with real tangible incentives. By far one of the better websites I’ve seen in any genre and definitely motivating me to tackle that long honey-do list. Thanks guys!! Man! I gotta make these sawhorses just so I can build the hangers and hang them in my garage. Crap! That means I gotta clean the garage. I have a lot of work ahead of me. Nice Work, Ethan! much like tommyo, i too discovered your site through this article on Art of Manliness. Since I’m looking to buy my first home, this is going to be an invaluable resource. I’ve read a few articles and my imagination is already going nuts with the possibilities. For now though, thanks for teaching me about French Cleats… brilliant way to hang stuff. I’m glad you stopped by! I hope you’ll register for an account and, I’m looking forward to seeing your comments around the site. Can you please post the plans for the folding saw horses.